Leslie Jones has been an IT geek, a graphic designer, and, much like her heroine, an Army Intelligence officer, bringing her firsthand experience to the pages of her works. She's lived in Alaska, Korea, Belgium, Germany, and other exotic locations (including New Jersey). She is a wife, mother, and full-time writer and splits her time between Scottsdale, Arizona, and Cincinnati, Ohio. 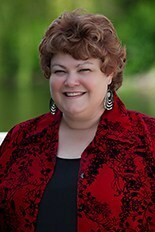 Learn more about Leslie and her books at lesliejonesbooks.com. Kim: Thank you for your service as a veteran and spouse! Can you share a humorous moment in moving around the world? Leslie: Thank you for hosting me on your blog! Our move to Germany was interesting, to say the least. DH flew to Frankfurt and made his way to Wildflecken, where the 11th Armored Cavalry Regiment stood in the Fulda Gap between East and West Germany. I packed up our home and drove to St. Louis to ship our car overseas. When I finally arrived in Frankfurt, DH had already been in the field for 4 weeks. He was allowed 48 hours to come pick me up before returning for 3 more weeks of training. When we arrived on base, he said, “Here’s your new house. Here’s your new(ish) Army-issue furniture. And here’s your new best friend.” And sure enough, the Army wife next door remained my best friend the entire time we were stationed there! We remain friends to this day. Kim: What was your favorite sight, sound, and smell of the Southwestern desert? Leslie: A lot of people believe the desert is barren and lifeless. Nothing could be further from the truth! Javelinas, coyotes, mountain lions, bighorn sheep, and elk roam freely, sometimes even into the city limits. Of course there’s a plethora of lizards and snakes, but there are also hummingbirds, quail, woodpeckers, and many kinds of hawks. My favorite sight: A tiny berylline hummingbird comes every afternoon to hover just outside of my office window. We stare at each other through the glass for about 15 seconds before she flies off. It always makes me smile. My favorite sound: Drive out into the wild desert in the deep of night. Turn off the engine and lay down on the hood of your car. See how brightly the stars shine without city lights. And, between 3 and 4 in the morning, listen to the intense silence as time stops. As the desert holds its breath, awaiting sunrise before it exhales. That’s the night hush. Kim: Who or what helped you along the path to publishing? Leslie: I had so much help! I had a terrific critique group for Night Hush. My agent spent a lot of time helping me polish and tighten it further into the book that started my journey. I’m also so grateful to the ladies of the Desert Rose RWA chapter for their guidance, mentorship, and encouragement! And most of all, my wonderful husband and son, who have been so supportive from the very first. Kim: What inspired your debut book, NIGHT HUSH? What sets it apart from other military romances? 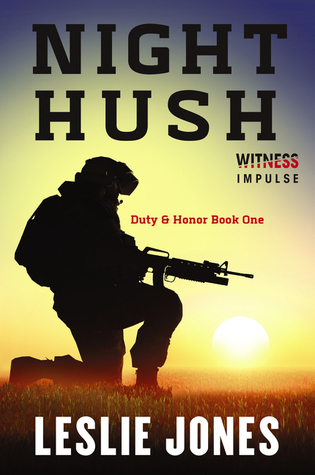 Leslie: Night Hush started as a single sentence: “The uncertainty was the hardest.” I had a vague vision of my poor heroine in the clutches of the evil man interrogating her. I knew my hero would be right there, outside the training camp where she was being held, but I also knew that Heather needed to free herself before Jace could bring her the rest of the way to safety. The rest of the story unfolded organically. Most ‘military’ romances tend to feature former SEALs, former Marines, former Special Forces, etc. They tend to be written by authors without any military experience. I wanted both my hero and heroine to be active duty soldiers. My personal experiences in the Army gave me tactical knowledge and an insight into the military mindset that most authors don’t have. Kim: What's next for Leslie Jones? 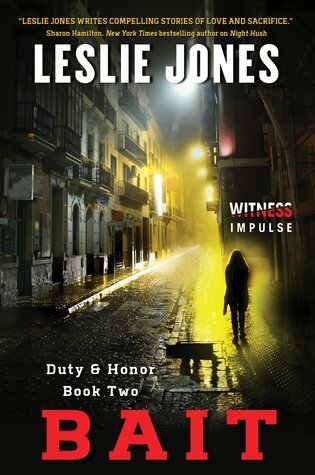 Leslie: I’m currently working on Duty & Honor Book 4, tentatively titled Not for Fame or Glory. 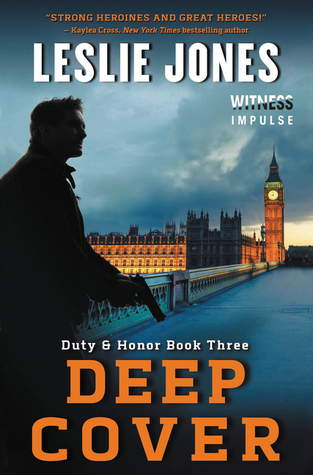 It features Mace, one of the Delta Force operators introduced in Night Hush, and Lark, a former hacker turned cybersecurity analyst, who was introduced in Deep Cover. They meet when Lark is inexplicably the target of an attempted kidnapping. Mace prevents Lark from being dragged away, but Lark, believing him to be one of her attackers, draws a revolver on him and threatens his life. Not for Fame or Glory should come out in September or October. When Army Intelligence officer Heather Langstrom's military convoy is ambushed and she's taken prisoner, she knows she'll need all her strength and courage to survive, escape her captors, and report the whispers of unrest brewing in the Middle East. Delta Force Captain Jace Reed isn't one to throw caution to the wind, but when his team stumbles upon beaten and weak Heather fleeing the terrorist training camp they've been dispatched to destroy, he'll risk everything to get her to safety. Once back on base, they learn her convoy's ambush was no accident … she'd been targeted. As the evidence of an impending attack mounts, Jace and Heather uncover a deadly terrorist plot that could kill hundreds of civilians. But Jace's protective instincts and Heather's fierce independence put them at constant odds. And as they close in on the extremists, they must learn to trust one another in order to save innocent lives … even if it means sacrificing their own. 1. Leave a comment about the US Army - what do you know about it? 2. Comments are open through Saturday, June 18, 10 pm in Baltimore. 3. I'll post the winner on Sunday, June 19. My dad was in the army during WWII. Thanks to Leslie for serving! I know the Army is the largest of our five services. Happy birthday to the US Army! I know the Army's wears Black and Gold! Congrats to Leslie for her Rita Nomination. I have so many relatives who served in the Army, even just for 4 years, during the Vietnam and Korean Wars. Thanks to Leslie for serving, too. I know that during WWII a lot of US soldiers were stationed in the northern areas of Australia. A jumping off point to the Pacific regions as well as helping to defend Australia. Ever grateful!! don't know what I hit that it posted before I was done. Sorry.BIL were Air Force and both of my sons are career Army. Congrats on your Debut Leslie. Sounds great. Looking forward to reading Night Hush. There birthday was June 14th......my dad and husband both served in the Army. Not much, my dad was USN and my brother in law was Air Force. The army is the oldest of the military services in the US. Many young men were drafted into it to serve their country. My gpa and several great uncles were in WW2. Not enough. But I know that we'd have fewer freedoms without the men and women who have served.